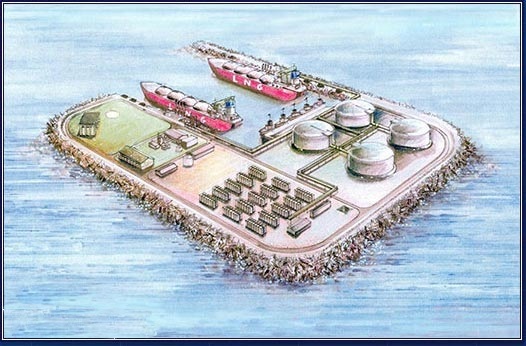 Atlantic Sea Island Group proposes to construct, own and operate a liquefied natural gas ("LNG") receiving, storage and regasification facility named "Safe Harbor Energy" that will be capable of delivering up to 2 billion cubic feet of natural gas per day to the New York metropolitan region. The facility will be located on an island to be constructed in federal waters on the Outer Continental Shelf ("OCS"), approximately 13.5 miles south of the city of Long Beach, New York, on Long Island and 23 miles southeast of the New York Harbor entrance. The facility will bring to the region a much-needed new reliable supply of clean-burning, cost-effective, and globally sourced natural gas. The island will be constructed in an open area of the ocean between the Ambrose-to-Nantucket and Hudson Canyon-to-Ambrose international shipping lanes. This project location allows LNG tankers to use established shipping lanes to access the facility, while minimizing interference with commercial shipping and recreational users. The project location, at approximately 40° 23' 19" N and 73° 36' 35" W, is in water depth of approximately 60 to 70 feet. The island will be constructed of natural sand, gravel, and rock materials, surrounded by armored breakwaters, consisting of prefabricated caissons, prefabricated armor units and rock, and capable of withstanding a 200-year storm. The proposed deepwater port has been located and designed to minimize potential safety, environmental and socioeconomic impacts. 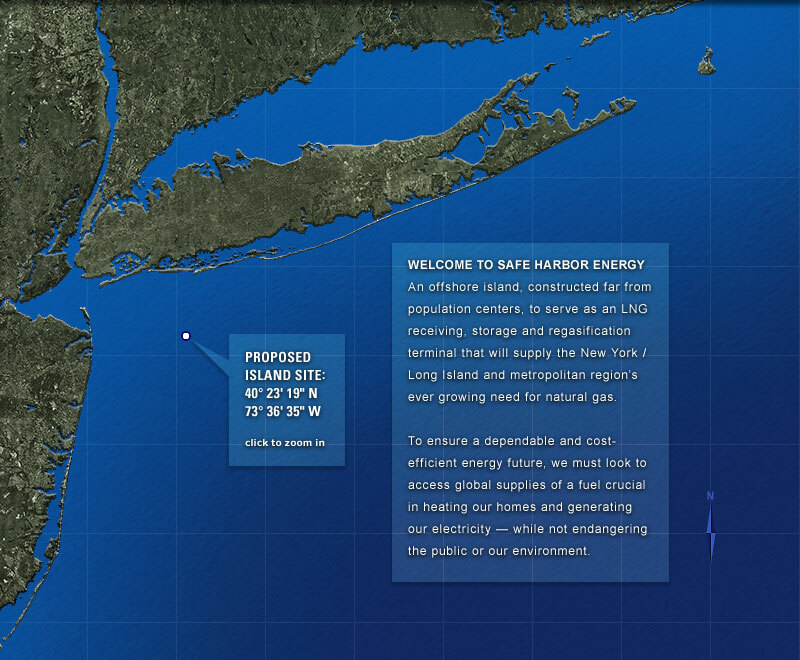 Its location will facilitate importation of LNG and delivery of natural gas to the New York area. Safe Harbor Energy anticipates the first shipment of LNG to the facility in 2014, following construction, installation and testing of the facility and training of personnel. Construction of the proposed port and terminal will take approximately 66 months after permitting. The Nassau Suffolk Building Trades endorsed plans today to build a Safe Harbor Energy Liquefied Natural Gas (LNG) facility some 23 miles from New York Harbor and 19 miles from New Jersey. The facility would provide 4 million man-hours of work for construction trades throughout the region while ensuring safe, secure access to this clean, crucial fuel. James Castellane, President of the Building Trades, stated, “Deemed `complete’ by the Coast Guard after two year’s worth of study and research, this proposal will now undergo a vigorous review by various government agencies that range from security to environmental. But this much is clear: Built on an island far out to sea, it will be distant from populated communities, protective of the ocean environment, and provide us with the means to ensure an adequate supply of LNG that is heating more homes, factories and offices. The building trades intend to be part of the process that gets it built.” The construction trades represent some 62,000 union members throughout Nassau and Suffolk Counties and have been a strong force for progressive construction that protects the economy, the environment and the region’s quality of life.